I have to give my husband credit for this one. 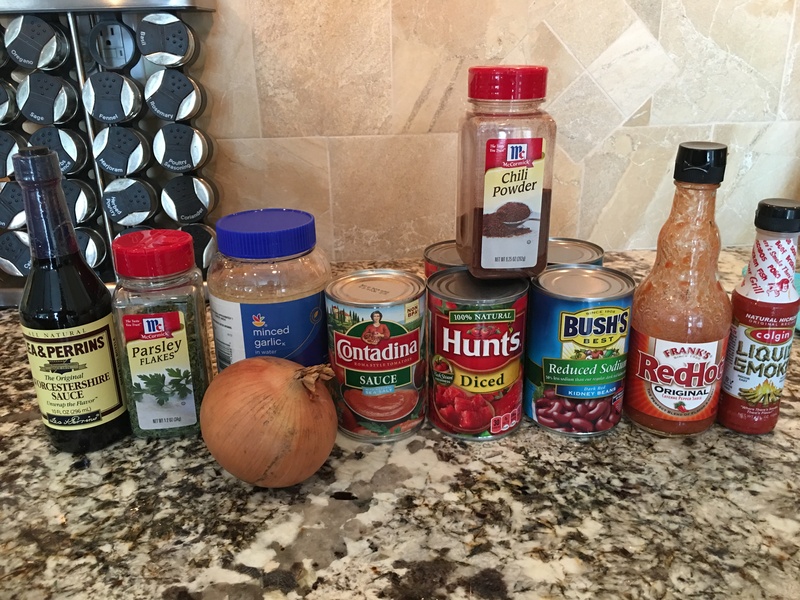 I started cooking up this chili years ago, but I didn’t use a crockpot- just a saucepan. Over time, he kind of took over and transformed it into a crockpot dish and added some ingredients. It’s smoky, sweet, spicy, and savory, all of which make for a home filled with a tantalizing and tempting aroma. And an even tastier dinner! 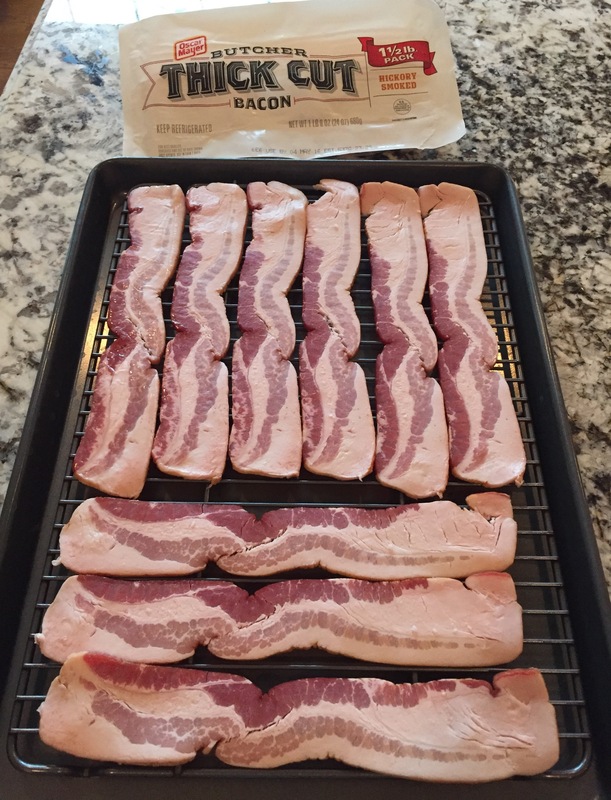 Place strips of bacon on a cookie cooling rack that is sitting on top of a baking pan, so that the grease drips into the pan. This is a great way to eliminate fat from the dish. Bake for 15 minutes or until desired crispiness is reached. 1. Caramelize the onions in skillet over low-med. heat. Add the garlic halfway through to prevent it from burning. All ready for the crockpot! 2. 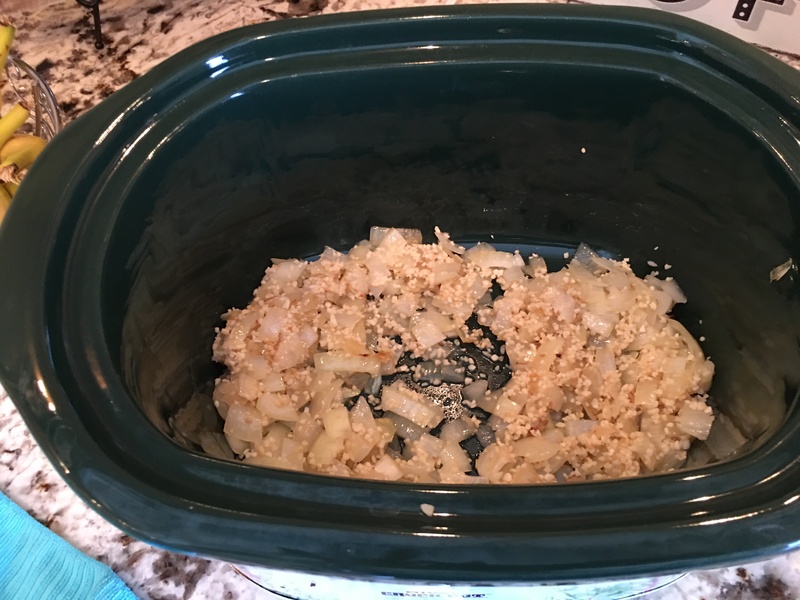 Transfer onions and garlic to the crockpot. 3. Brown beef in skillet over med. heat. 4. Transfer beef to crockpot, and add all of the other ingredients EXCEPT the parsley and optional items. 5. 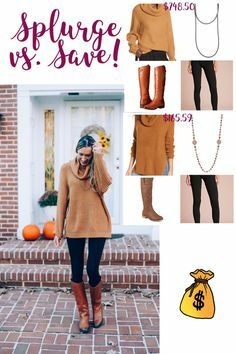 Mix it all up! Then cover and cook on low for 4-8 hours. We have eaten it after only 4 hours of cooking and it was delicious, but we usually let it go longer. 6. Spoon the chili into bowls and top with parsley and your desired fixings. ENJOY!? Hurry and get to the store so you can make your Sunday the best it has ever been. Everything is better with bacon! Oh, and Monday? That will be better, too, since you will most likely have leftovers. That’s what’s up this weekend. Did you guys cook up any appetizing recipes this weekend? Let me know, and don’t forget to follow me on on Instagram @thatswhatsupblogger and FB and Twitter (see icons in sidebar) for sneak peaks and other tidbits! Hope you are having a wonderful weekend.